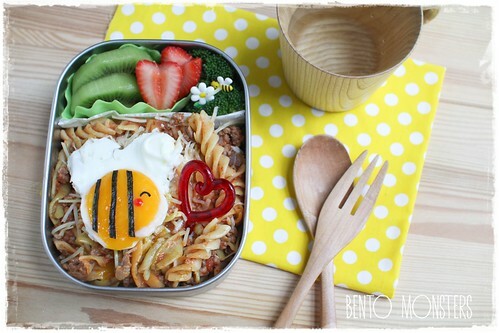 The bentos I'm sharing today were made around two weeks ago. I wanted to make bees out of Sunny Side Up eggs, but the eggs did not turn out well that day. I still went ahead with it anyway, as I did not want to waste the eggs. Quite an easy charaben, just added some nori on the Sunny Side Up to turn it into a bumble bee. 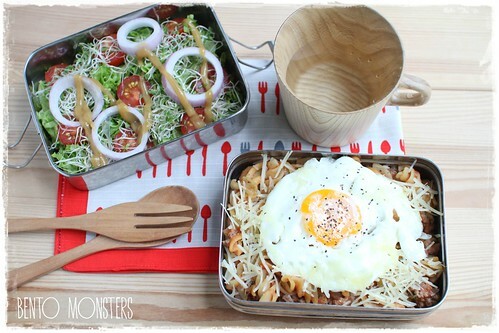 I cooked pasta bolognese for my boys' lunch that day. I added in broccoli, golden kiwis and strawberries at the side. I remembered delivering one box to IT, as it was Monday that day, and he had to stay back in School for his CCA. 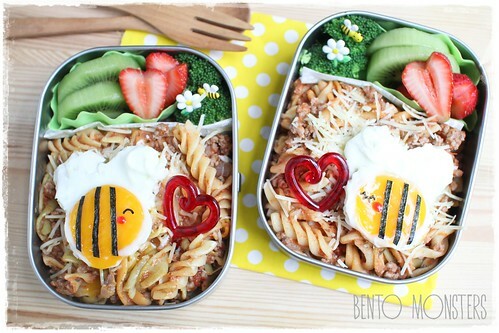 Love the bee eggs, they turned out very nice and yummy,your lunch looks so yummy too!! The bee eggs are so cute!